Being professionally relevant and moving forward in one’s career isn’t, as they say, what it used to be. It’s rare to find anyone today who stays at one company for 40 years and retires with a pension. Few of us would even consider staying at the same place (or in the same role) for 20 years! The fact is, professional life is no longer linear. 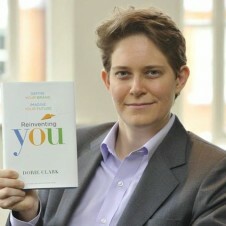 Dorie Clark, a brand expert and the author of “Reinventing You: Define Your Brand, Imagine Your Future,” doesn’t just talk the talk; she’s a prime example of repositioning. Clark is intimately familiar with the art of the personal pivot and what it takes to successfully re-create, build, broadcast, and maintain a professional brand. Over a fabulous lunch at the Harvard Club in N.Y.C., Clark and I discussed her book and what it takes to craft a new professional persona, in order to extend your career longevity, success, and happiness. Posted September 17th, 2013 & filed under Interviews.